When USA Today best selling author, Lois Winston, came up with a brilliant idea for a different kind of collaboration I jumped at the chance to take part. Her idea – to bring together a bunch of authors, have us share one of our favourite dessert recipes, along with some sage advice on both love and writing… and then put it all in a book. When will this book be available? I hear you ask. Soon, I’m pleased to say. Very soon. In the meantime, I thought I’d whet your appetite with a sneak peak at the book cover. So if, like many Romance authors, you have a sweet tooth… wonder what our recipes for that lasting, loving relationship would be… and/or are interested in writing, then watch this space! 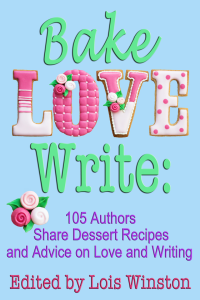 Or you can join in the fun of Bake, Love, Write’s road to publication by visiting its very own Facebook page.